Pour into 12" x 20" x 4" steamtable pans that have been sprayed with pan release spray. Add onions, mustard powder, barbeque sauce, water, black pepper, and Creole Spice Blend to beans. Stir lightly to until mixed. Cover pans with aluminum foil. Conventional oven: 350 degrees F for 1 ½ hours. During last 30 minutes of baking remove foil to encourage browning. Portion with 4 ounce ladle or 4 ounce spoodle per serving. 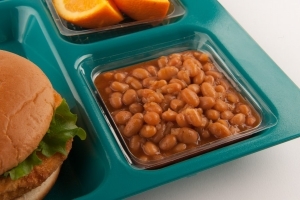 Each portion provides ½ cup of beans/peas. 1 pound, 8 ounces of fresh onions may be substituted for dehyrated onions. Baked beans must be counted as either a vegetable or meat/meat alternate and cannot be counted as meeting both components in the same meal. Please see recipes "Baked Beans (Canned)" (MRS 1000) for a baked beans recipe using the ham and "Baked Beans (Vegetarian)" (MRS 918) for a recipe using the MS Southwest Spice Blend.